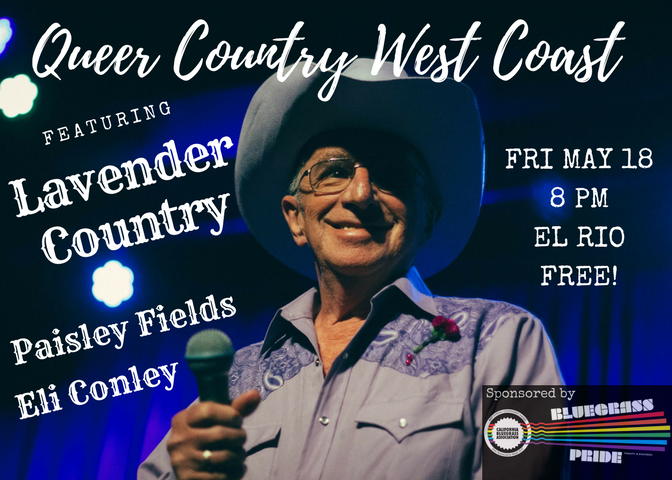 Friends, Queer Country West Coast has a very special spring show in San Francisco that we are so excited to share with you! Paisley Fields will be here from New York, celebrating the release of their fabulous new album Glitter & Sawdust. They are regulars at Queer Country Quarterly in Brooklyn, and we can’t wait to have them here in California. As if that weren’t enough, our headliner is Lavender Country! Lavender Country was the first the first openly gay country band, founded by Patrick Haggerty in 1973. They recorded a self-titled collection of gay radical country music, and though all of the records sold and the project was celebrated in a small portion of the gay community, Lavender Country proved too extreme for the music industry of the 70s and the project fizzled. 40 years later, independent record label Paradise of Bachelors reissued Lavender Country to rave reviews and a much more accepting public. Patrick and his music became the subject of an award winning short documentary, Cryin’ These C*cksuckin’ Tears, and Lavender Country went from being a lost obscurity to an underground legend. I’ll be hosting a performing some new songs to open the show, accompanied by Alina Fox on viola. This show is sponsored by Bluegrass Pride. Founded on the principle that bluegrass is for anybody and everybody, the California Bluegrass Association created Bluegrass Pride in 2017, an initiative to become the first ever bluegrass association to take part in an LGBT Pride celebration. The CBA and Bluegrass Pride were officially named the Best Overall Contingent in the 2017 SF Pride Parade, the first time in parade history that a first-time entrant has won the top prize. Now in their second year, Bluegrass Pride is continuing to grow and spread the word that bluegrass is for everybody, by hosting regular beginner-friendly jams, sponsoring a local concert series, and marching in the 2018 SF Pride Parade. They’ll be with us selling t-shirts and accepting donations for the 2018 float. 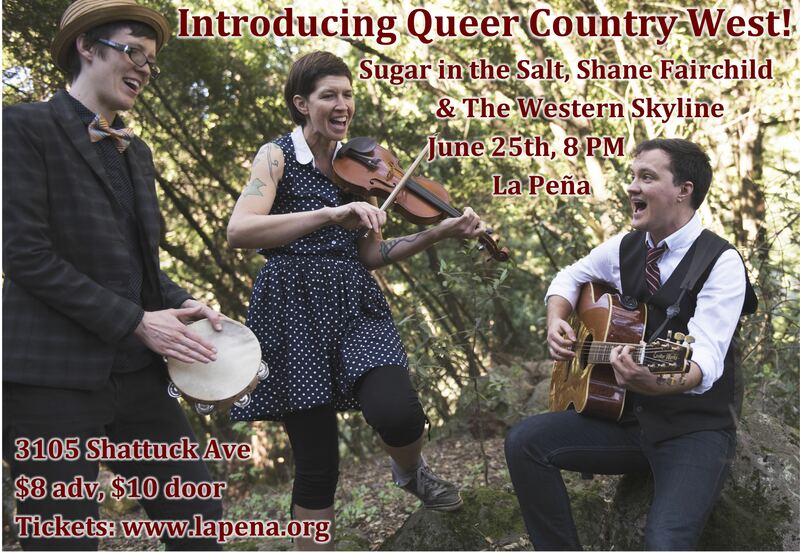 Notes: Queer Country West Coast is beyond thrilled to be featuring Lavender Country, the very first openly queer country band, founded by Patrick Haggerty in 1973! 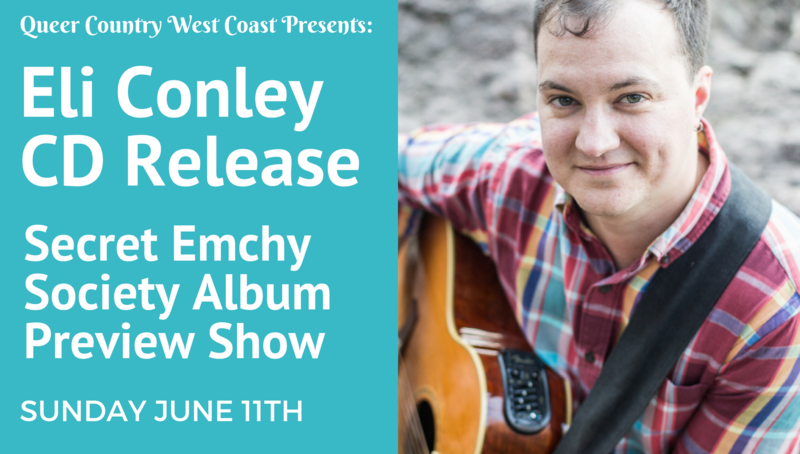 Paisley Fields joins us on tour from New York to celebrate the release of their new album Glitter & Sawdust, and host Eli Conley will perform as well. This is a show not to be missed!